“Fools Pools” Swim School re-opened in July 2010 with the main pool under cover inside a state of the art, European designed enclosure. 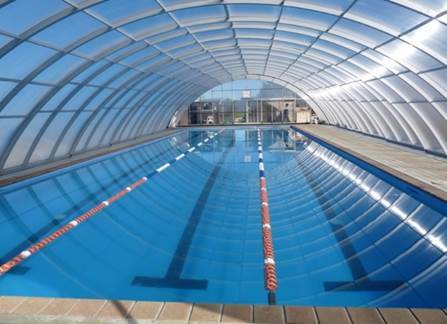 The enclosure is fully insulated, as well as being fully retractable, allowing the pool to be either indoor or outdoor depending on the season. These types of enclosures are used in Europe in snow conditions, so are more than adequate for NZ conditions! Fools Pools Swim School is a registered Quality Swim School with Swimming NZ. All our teachers go through training with Swimming NZ or a similar education provider, as well as induction training at Fools Pools. We aim to provide a swimming environment that is both supportive and encouraging for our students, where achievable challenges are set so that students gain a real sense of achievement from their efforts. Our mission is to continue to raise the level of swimming competency in the Muriwai community and surrounding districts. We encourage you to use this facility, and to respect it! We believe that everyone has the right to learn to swim and to enjoy the water. Use it for your own fitness, strength and rehabilitation programs. Come to swimming lessons here if you would like to learn to swim or to increase your skill in the water, or just enjoy the pools for your own peace of mind and wellbeing. This facility is also an ACC registered vendor for hydro-therapy (water rehabilitation programs), so get a referral from your doctor or physiotherapist if you require water rehabilitation services covered by ACC. Since Oct 2014 we have been running our main pool using Enviroswim technology. It’s really like swimming in pure tap water – fantastic for your health, swimming togs last longer, and it feels amazing! We offer one on one, or two on one, private swimming lessons, for swimmers at all levels. The pools are open for casual swim training outside of Swim School hours. All swimmers must wear swimming caps. During the school holidays the main pool is open for general public swimming until 8pm each day. The small pool is open until 6pm daily. Note that, on public holidays, Sunday opening hours are observed. Also, casual swimming is not available when Surf Club training is on. 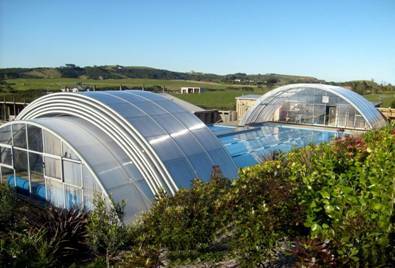 The main pool is heated via heat pumps. The small pool has a salt water chlorinator installed, and is heated via a heat pump.